Join us on the 22nd June 2019 for drinks and canapes in the beautiful Grade 1 listed private Moreton House, followed by a three course dinner with wine in a Midsummer themed marquee, plus cheese and coffee and dancing. Held in aid of the Dorset Charity, The Alcohol Education Trust who are celebrating their 10th Anniversary and raising much needed funds to ensure that young people across the South West can be supported in how to stay safe around alcohol. or for more information, please click here. 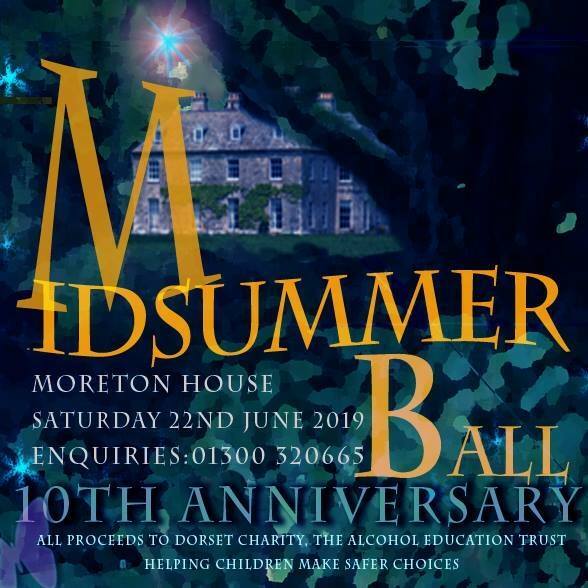 Ticket for the Alcohol Education Trust 10th anniversary Fundraising Ball on 22nd June 2019 – Join us on the 22nd June 2019 for drinks and canapes in the beautiful Grade 1 listed private Moreton House, followed by a three course dinner with wine in a Midsummer themed marquee, plus cheese and coffee and dancing. Held in aid of the Dorset Charity, The Alcohol Education Trust who are celebrating their 10th Anniversary and raising much needed funds to ensure that young people across the South West can be supported in how to stay safe around alcohol. If possible, when buying tickets, please enter the names of all ticket holders in the order notes at checkout.